Find answers to important questions about the game of blackjack. Learn whether or not the game is beatable, and get tips on winning and picking a table. In this section, you can study basic strategy for both single and multiple deck games. For beginners, mastering basic strategy is the first step to greatly increasing one's odds of winning. 1. What makes blackjack popular? 2. Can I really gain an edge over the house? 3. Is basic strategy better than any other strategy? 4. Should I ever surrender? 5. Is it cheating to use strategies that reduce the house edge? 6. Can I become rich playing blackjack? 7. How can I get ahead? 8. Are there other advantages beyond basic strategy? 9. What should I do if the pitboss is watching my play? 10. What should I look for when choosing a table? 11. How is playing blackjack different at online casinos? 12. What online casinos offer the best games? 13. What about drinking while playing? 14. What percent of my bankroll should I wager on one hand? 15. How do I know the dealer is not cheating at online blackjack? 16. Is there an easy card counting system to follow? 17. Is it better to play one-on-one in online blackjack, or multi-player? Blackjack is the most popular table game at casinos worldwide for several reasons. First, it is one of the handful of games which offers players the best odds. This means that the house has a minimal advantage, and the players have a good chance of winning on any given hand. Secondly, it is fast paced. Most people enjoy a game where the hands go quickly, and the odds are always changing. The flip side of this is that your bankroll can fluctuate greatly in either direction. You can be up 100 one minute and down 100 the next. If you are a beginner, this is something you need to get used to. Lastly, people enjoy blackjack because it is relatively easy to learn. Blackjack game rules are very simple: whoever gets closest to 21 without going over wins. The dealer must hit to 17, etc. If you look at the basic strategy charts, they may seem overwhelming at first. I suggest playing a lot of practice hands preferably with some software from the play-for-fun section of an online casino. After a lot of practice, and learning how to act in different situations, you will automatically acquire most of the information you need to master basic strategy, and it will become second nature. 2. Can I really gain an advantage over the house? Once you have mastered basic strategy, and are able to play blackjack as close to perfect as possible, you will still give up a very small advantage to the house. This ranges from ½% to 2% depending on table rules, and how well you play. This really isn't bad considering other casino games offer players much smaller odds of winning. What's more, the way you can increase your chances of winning money is by taking advantage of doubling down and splitting. While you may only win 49 out of every 100 hands, you have the option to double down or split, where as the dealer does not. Another thing that increases your winning potential is the 3:2 payout for getting a blackjack. If the dealer gets blackjack, you lose your bet, but if you get a blackjack, the dealer pays 1½ times your wager. Subtle things like these offer players a little better odds. Be sure to study the basic strategy charts for best results. Most online casino software uses a shoe containing six-decks for play. Land-based casinos offer both single and multiple deck, so it's good to learn both. If you're just starting out, try learning basic strategy for multiple decks because it is found at more casinos. Basic strategy charts are products of millions of hands of computer-simulated blackjack. If you know about averages and standard deviation, then you know that the more time you flip a coin, the closer the results will come to 50% heads, 50% tails. The suggested actions on the charts are the best possible moves for the player to make considering the dealer's up card. When playing according to the charts, you will not win every hand, but you will stand the best chance of winning the hand. Also, when it suggests doubling down or splitting, it means you have a good chance to increase your winnings or decrease your losses (in cases where you should surrender - see Question 4). Surrender is a rarely-used option which very few players ever take advantage of. It is also becoming less common for casinos to offer it. One misconception is that it is always better to play out a hand rather than opting to surrender and giving up half your bet. In almost all cases this is true. If a multiple deck game offers the option, you should always surrender a two-card hard hand of 16 (except a pair of 8's) against a dealer's up card of 10. Why? Because a 16 is one of the worst possible hands for a player, and odds are you will lose about 80% of the time, regardless of how you play the hand. This method, known as Early Surrender, is where a player surrenders on the first two cards (before the dealer has checked the hole card for blackjack). Late Surrender occurs only after the dealer has checked for blackjack. If you're counting cards and the actual count goes above +2, it's okay to surrender your pair of 8's instead of splitting them. Mainly you will only use this option when you have a hard 15 or 16 against the dealer's 10. Using surrender will result in only losing half your bet. You don't get to play out your hand, but you don't lose your whole bet either. While the (late) surrender is not of much value to the basic strategy player, it becomes much more valuable for card counters as one uses the surrender more with high counts (and big bets out). The surrender option is uncommon these days, so if you come across it, be sure to take advantage of it - as long as you play it correctly. Remember, basic strategy is not only about helping you increase your winnings, but also cutting your losses. It is to your advantage to lose only half your bet rather than the entire amount. Over time, this will cut losses, thus increasing your winnings. While casinos ultimately prefer inexperienced players to occupy the majority of the seats at blackjack tables, there is nothing wrong with educating yourself and becoming a better player. In fact, many casinos provide a basic strategy chart in the gift shop, or in their hotel rooms. We suggest learning these strategies long before arriving. Casinos understand that the majority of players are the less-experienced variety, and that the smaller group who does know how to play properly will not make much impact on their bottom line. So, it is to your advantage to utilise this opportunity if you plan to play. It is unlikely. Another common misconception is that you can get rich by playing blackjack. Sure, there are hundreds if not thousands of professional gamblers in Las Vegas and Atlantic City, and most of these players are making a tidy profit or breaking even. Even if you play perfect blackjack, and reduce the house advantage to almost nothing, chance will still play a big part in how much you win or lose. It's not to say that it is impossible, because every casino has an amazing story about how some guy went from 500 to a million in one night. So, focus on making a profit in the short run, and remember that there will be swings in your bankroll. Learn basic strategy. If you never tried learning blackjack strategy before, it may seem a little overwhelming. When I first decided to master the game, I thought... "man, I'm never going to be able to remember all this!" Well, I can tell you exactly how I learned. I didn't use flash cards, but you can. I think the best way is just to print out the charts, and use a computer simulator. You can practice on one of our free blackjack games as long as you like. For serious training, I would also recommend downloading a simulator program which helps track your play. Once you feel you have mastered basic strategy on your computer, try taking your game to the local casino. When you get to the actual casino floor, you will likely find that there are a few more distractions to contend with like noise from slot machines, other players, wait staff, etc. When you are at the table, try to block out any distractions, and focus on the game. The more you play, the easier it will get until it finally becomes second nature. To become a professional blackjack player, one must learn how to count cards. Casinos don't look kindly upon card counters because they know that these players have a small, yet measurable edge over the house. Learning how to count cards is what truly makes blackjack a beatable game. If you are able to master this, then odds between ½ and 2 percent will lie in your favor. There are many different methods that people employ to count cards, each with unique angles and variables. Some are as complex as rocket science. The truth is that the most complicated systems will not yield a sizable advantage over the simplest ones. If you have mastered basic strategy and want to take your game to the next level, go to your local bookstore and look for a blackjack book that covers card counting. If the quality or your level of play has attracted the attention of a pitboss, just keep playing as you are. Don't be nervous or start thinking that you are about to be escorted into the casino's dungeon where henchmen will 'get medieval' on you. That might have happened back in the 1970s, but you probably won't see that level of security today - at least not within 50 miles of Vegas. If the dealer or pitboss makes any comments about your play, just attribute them to luck. Anybody can have a hot streak. Usually, dealers are on the player's side. They enjoy seeing a player win big. This is partly due to the possibility that they may get a good tip from a player who has made out well. If you are winning and plan to cash out soon, toss the fellow or lady on the other side a token of your appreciation - if the quality of service warrants it. If the pitboss makes further inquires about whether or not you know how to play blackjack, just tell him that you got a basic strategy card from the gift shop. The worst that can happen is that they ask you to stop playing and maybe even to leave. If that happens, so what? It means you are good enough or lucky enough to make them not want to give up any more winnings to you. There are always plenty of other casinos so don't be afraid to use your knowledge to help your play. When in Las Vegas or Atlantic City, you will find that different casinos offer slightly different rules on blackjack play, so feel free to cruise around the town until you find one that is most favorable. If you prefer to play only where you are staying, be sure to look around the floor to find the best tables. Understand your betting style. Certain tables offer higher or lower minimums and maximums. If you are not a high roller, try starting at the low minimum tables. Good rules to look for include: doubling on any number of cards, doubling after splits, splitting and re-splitting aces, surrender, etc. Whether you've been playing blackjack all your life, or are just learning the game, there are a few things you should know about playing blackjack at online casinos. The first thing you may notice is that the games can move a lot faster. At land casinos, it takes time for the dealer to pass out the cards, shuffle, and for all the players at the table to hit/stand, etc. When playing at most online casinos, you will be the only one at the table (unless it's a multiplayer game), and the dealing is done electronically and usually quite fast. This is good for the player because you can play through more hands in less time. If you're playing a perfect game using basic strategy, the odds favor your play in the short run. More hands played also means your bankroll can go down a lot faster - so be sure to keep an eye on it. I would recommend playing perfect basic strategy and setting a percentage goal for your short term winnings (say 20 to 50 percent depending on the size of your bankroll). Example: You deposit 200 credits to play blackjack. If your chips get up to 300, or a 50 percent gain, cash out. Remember, when playing a near-even odds game like blackjack, the longer you play the closer to even you'll be. Your goal is to win money, so play perfect strategy, and set a win limit for cashing out. Finding an online casino can be tricky. With so many choices available, it might seem hard to find one that has both a solid track record, and good games. After downloading software and testing games from many different casinos, I personally recommend all Playtech and Microgaming casinos. Microgaming casinos are noteworthy due to the large variety of blackjack games available. There's something for everyone. The basic game of blackjack you'll find at Playtech casinos is enjoyable because it's one that actually lets you win money. It's a multi-deck game (four decks I believe), and the dealer doesn't draw to 21 with suspicious frequency. What you get is a game that rewards intelligent play - very close to what you'd find at a land casino with good rules. There's no edge for counters - as penetration isn't displayed, but a nice feature is that you can view the results of the previous 19 hands. Playtech casinos are some of the only ones to offer in-game play tracking. Browse our listing of approved online casinos to find a casino featuring blackjack games by Microgaming or Playtech. The complimentary drinks that casinos offer to players can be very tempting, but an old adage says that it's best not to mix alcohol and gambling. Blackjack is a game which can require great concentration on the player's part. Keeping track of the count and using perfect basic strategy are best done with a clear head. If you're a total rookie who is just out to play a few hands during your vacation, wait until after your playing session has ended before having those Mai-Tais. Even if you aren't employing advanced strategies, you'll still want to have good focus on bankroll management. It's easier to avoid getting carried away, and you'll feel better about it when you do finally kick back. Many experts recommend starting with a bankroll that is equal to 100 times your average bet. Having plenty of extra chips will help you sustain the swings that are inevitable in blackjack. So, if you are playing 5 credit chips, try to start with a bankroll of around 500. Slightly more would be preferable once you factor in what your average bet really is, due to splits and double downs. Many casinos popping up in new places have much higher minimums than you'll find in Las Vegas, so sometimes bringing a bankroll of 100 times your minimum bet is not always possible. You can certainly get by with less than 100 times your bet, but if you're playing to win, a well-equipped bankroll is a very important factor. 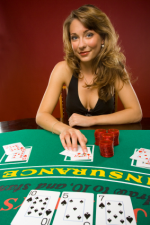 It may seem like there is no way to tell if the online game of blackjack you are playing is honest or not. This is a logical assumption, since there are no visible cues like shoes or shuffling taking place - things which reinforce an honest game in the real world. So how can you make sure you're not being cheated? The best way to feel safe with your bets is to play at casinos that are audited for fairness. All Microgaming brand online casinos are checked monthly by one of the world's biggest accounting firms to guarantee fair and random odds of winning for players. Monthly audit reports are usually found at the casino websites to allow players to compare the payout rates for various games. All of their games feature a computerized random number generator - based upon those used in modern land casinos. Some online casinos make no such guarantees of fairness, so be wary. Basically, your best bet is to only play at casinos that back up claims of fair odds with real facts and regular audits. As the cards come out of the shoe, you want to keep a running total in your head. This is done by starting at zero (or "even") and then adding or subtracting points based upon which cards appear. Aces and face cards subtract a point, 2's through 6's add a point, and 7-9 count as zero. When the count is positive, it favors the player, meaning that more high cards (10s) are likely to come out of the shoe, and the house edge is reduced. Players want high cards because they help make strong hands - like blackjacks, 20's, good double downs, etc. When the count is negative, it favors the dealer. The dealer benefits from small cards because they help draw to 21 better. If a dealer is showing a 6 (assuming he or she has 16 total), what would they need to come closer to 21 - a high card or low card? So you see how the count can play an important role in determining the true odds of a game at a given moment, and also which cards are most likely to come out next. The best way to learn counting is to practice - a lot. You'll probably need at least 10 hours of play at home with a computer simulation before considering taking your new skills to a real casino. Visit cnet's download section for a good variety of practice games - many of which have count training and strategy tips built right in. Another good way to practice is to simply take a deck and turn over the cards one at a time - keeping the count as you go along. Expert counters are said to be able to "count down a deck" as fast as it can be dealt. Once you feel comfortable with your basic counting ability, go to a casino and just watch a game for a while. This allows flexibility in adapting the concept to the actual process. Remember, once you know how to count, the important thing is to make it look like you don't - to the dealer, the pit personnel, and even other players. That is an equal part in the skill of counting - to disguise your knowledge. In reality, the ideal game of blackjack is played between one player and the dealer. This allows for fewer deviations in the expected odds that may occur due to other players' actions both in play and demeanor. When it's just you and the dealer, it's easier to get a handle on counts, and there will likely be fewer distractions - like inexperienced players. When playing online blackjack, it becomes a little harder to figure. First, you'll need to find out how many decks a casino is using - fewer decks means better odds for players. Also, some casinos shuffle after each hand - others once a deck is run through. A lot of factors can influence which method of play is optimal, and those vary widely from casino to casino. One thing that usually brings marginally higher odds for players is playing a second hand. Many online casinos feature multi-hand blackjack games where you can play one to five hands at a time. your next trip to the tables. Learn about the various bets available and basic elements of gameplay in blackjack game rules.